Do you like it? I do. In fact, I like it so much that I’m dedicating an a blog entry to it. It’s amazing how much meaning can be crammed into a single sentence!! The most quoted and, apparently feared, firearm on the face of the planet. The Avtomat Kalashnikova selective-fire, gas operated, 7.62 x 39mm rifle was officially adopted for use by the Soviet Army in 1947. Since then, it has become a favourite for military forces around the world, due to its robust design, reliability, low cost and ease of use. AK-variant rifles are, in fact, the most widely produced assault rifle in the world [Source: Weaponomics: The Global Market for Assault Rifles; Killicoat, Phillip; WPS4202; April 2007]. The AK-47 is also incredibly popular among gun control advocates. Every time a government suggests relaxing gun control laws, the cries of “Assault rifles will be easier to get! !” are heard from coast to coast. They intentionally invoke images of madmen running loose with AK-47s, shooting anyone who happens across their path. In the minds of gun control advocates, the AK-47 is the most dangerous gun ever made and nobody should ever own it, or anything like it. They rely on the average person’s ignorance about firearms to create a state of fear and further their cause. The bottom line is that a gun is a gun is a gun. All are inert objects, the only danger comes from the person behind the trigger. The Arab Spring: a string of revolutions throughout North Africa and the Middle East. To mention but a few highlights, it began in Tunisia in December 2010, led to the overthrow of the Egyptian government in February 2011, and 9 months of bloody civil war in Libya. The fighting has calmed in most affected countries, but still rages unchecked in Syria. The protests, demonstrations and revolutions that rocked the Arab world were widely hailed as positive by the Western World. They were seen as pro-democracy, the will of people, and the start of a positive new future for citizens of oppressed nations. The hypocrisy of it all is that, while groups such as Amnesty International supported these uprisings against oppressive regimes and dictators, they continued to try to disarm the very citizens they were supporting! Now that the war has ended, the UN has become very vocal about disarming the people of Libya. They are actively working towards preventing any future generations of Libyans from having the means to fight for their freedom if the need arises again. Libya is a fitting example for the gun control issue on another front as well. They have some of the strictest gun control laws in the world. Civilian gun ownership is entirely prohibited and it is also illegal to privately sell or transfer them. Despite gun ownership being illegal, civilians own nearly twice as many guns as the military and police. Civilian firearms are numbered at about 900,000, military firearms at 535,200 and police firearms at 22,000. The rate of civilian firearms ownership is 15.5 per 100 people. In comparison, in Canada, the rate of civilian firearms ownership is 23.8 per 100 people [Source: Small Arms Survey, 2007]. Let me say that again. In a country where civilian ownership of firearms is completely outlawed, the citizenry still outgun the military and police by almost 2:1!!! To summarize, while organizations like Amnesty International fully support the revolutions of the Arab Spring, they are doing everything in their power to ensure that the people revolting are denied the very tools that they need to succeed. Licensing. This is the process through which a government body determines an individual’s fitness to own firearms. It essentially states that firearms ownership is illegal unless you are granted an exemption from that law by means of a license. Registration. This ties a firearm to its owner by means of a registration certificate. The certificate contains information regarding the type of firearm (make, model, serial number, etc) and that certificate is linked to a specific firearms license holder. They seem innocent enough on the surface, but these two puppies have been the cause of much death and destruction throughout history. Put simply, every major genocide of the twentieth century was preceded by civilian disarmament – Ottoman Turkey, USSR, China, Rwanda, Guatemala, Uganda, Germany. These confiscation schemes were all aided through systems of licensing and registration. It’s common sense really – you can’t take a gun away from a person if you don’t first know that they have it. 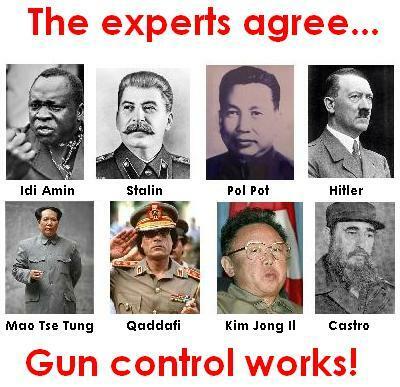 In some cases, Hitler and Mao for example, the introduction of the gun control laws was very methodical and a strategic part of their plans. In other cases, Rwanda and Guatemala, the existing laws were a simple and convenient means to a horrific end. The bottom line is that the intentions of the people who enact these laws are irrelevant. What’s important is the potential for abuse and misuse of these laws in the future. Simply put, if the potential for misuse exists, it’s a bad law. Muammar Gaddafi was one of the longest reigning and perhaps one of the most well-known dictators in recent history. The reason that Muammar Gaddafi is dead is because the people of Libya had the resolve to rebel against him. The means of their rebellion was their ability to fight for their freedom through the use of privately owned firearms. The people of Libya were still armed, despite prohibitions on firearms ownership, simply because the country did not have a system of licensing and registration in place that would have allowed for wholesale confiscation. If Gaddafi had gun controls in place, he would have confiscated firearms prior to viciously crushing the resistance, making many pay the price so that he could remain alive, unchallenged and in power. Civilian gun ownership is not about hunting or target shooting or even home defense. It is about freedom and democracy. Many gun control advocates imagine a world where only the police and the military own guns – a police state. Others imagine a world of peace where nobody needs guns. While this is a noble goal, it is not the world we currently live in. Until the causes of violence are addressed, guns will continue to be a necessary tool in our lives. I was shown this video today and found it to be a very powerful and well thought out argument. It needs sharing with everyone you know. There is a misconception all over the western world that guns are a “right-wing” issue. The topic of gun control has been framed as a left vs right argument, with gun control supporters on the left and gun owners on the right. This is far from the truth. The gun debate does not fall strictly within party lines. History shows that gun control can be introduced from either the left or the right, but that it always has unintended negative consequences. Outside the western world, the truth of the gun control argument is obvious.